Small and midsized business (SMB) principals want two things in a salesperson: an understanding of their business pain points and knowledge of their industry challenges. 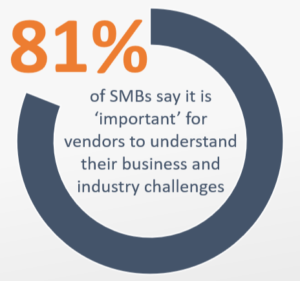 In fact, 81% of business owners in a recent Bredin survey of 500 U.S. SMB principals say it is “important” for vendors to understand their business and industry challenges. Here is how content can make your sales team more effective at finding leads, nurturing prospects, and closing sales. In another recent Bredin survey of SMBs, “experience and expertise in my industry” ranked second only to clear/competitive pricing in choosing a tech vendor. Likewise, in banking, our research found that the majority of SMBs want a bank partner who “understands the needs of my business” and “has products and services tailored to my industry.” The larger the SMB, the more they value this expertise. Giving your salespeople advice-rich handouts for events and content for email and social media to help generate leads. Creating industry overviews and content detailing SMB hot-button issues to increase your sales team’s SMB IQ. When we asked SMBs how often they want a vendor salesperson to keep in touch when they are not ready to buy, the plurality said monthly. Guides, checklists, case studies, and other content make a check-in more meaningful and help salespeople stand out from the crowd. The right content asset communicates a salesperson’s understanding of SMB pain points. It can also help SMBs assess their needs, understand why you have the better mouse trap, and make a case for buying from you. Fifty percent of SMBs with 20-99 employees prefer that salespeople follow up via email. That gives you a great opportunity to promote value-added content such as a case study, blog post, research report, checklist, or other advice-rich asset. Half of all SMBs say they like “in-person meetings with sales representatives” as a way to stay in touch. In this case, leaving behind a piece of value-added content such as a case study or comparison table can help to demonstrate why you are the best choice.